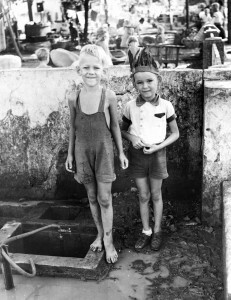 The Atom Bombs helped to bring the Pacific War to an end. That is generally well-known, but how and why the destruction of Hiroshima and Nagasaki persuaded the Imperial Japanese government to surrender is perhaps not so widely known. 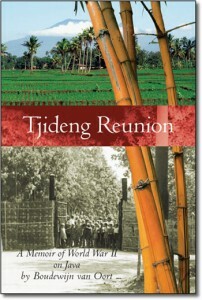 The book Tjideng Reunion, dwells on this topic in chapter 9, as part of the description of our life in Tjideng between early May and end September 1945 , and how the pursuit of the Pacific War during that period affected us. This interpretation of those key events has been informed by some recent historic scholarship. To date the use of Atomic weapons in the course of warfare remains restricted to those two blasts within three days of one another in early August 1945. They can thus be described as as singular event of the twentieth century. We have moreover since then lived under the shadow of this awful weapon. A valid question might then be the following: what was the balance between costs and benefits of those two bombs? We have a fairly clear idea how many lives were lost, but how many were saved? One might deride this as an absurd question, but then warfare in it entirety is absurd. Did the Atom Bombs prevent another Holocaust? Certain observers have made the claim that we narrowly escaped a Far East Holocaust. The term “holocaust” has in my opinion very specific meaning associated with the terrible racial policies of Hitler and his fellow travelers. I may be wrong but I do not believe such a threat hung over our heads within the context of the military struggle that unfolded after March 1942. We European civilians were treated brutally, but so were many more Asian civilians. And Allied military personnel were treated as slaves. The treatment was bad and contrary to our views of humaneness, but not a holocaust. An attempted Allied invasion, fervently hoped for by us in the Internment camps on Java, might have caused a different outcome. The events in Manila between February and March 1945 were perhaps symptomatic of what might have happened. But an Allied invasion of the Netherlands East Indies, Java in particular, was never attempted. So this is speculation. An Allied invasion of Japan, on the other hand, was a logical consequence of the Allied war aim of seeking unconditional surrender. That is how the war was won in Europe. The events in Manila referred to above and on other Pacific battle grounds, had by July 1945 made abundantly clear to all concerned that Asia was somewhat different from Europe. The casualties resulting from an invasion of JapanÂ were projected to be astronomically high. Was Bombing the only Alternative to end the War? WWII bombing of European cities had not always brought an immediate capitulation. By July 1945 so many Japanese cities had been bombed that very few targets worthy of atomic weapons remained. Japan nevertheless refused to surrender. Bombing most definitely was not the only alternative for ending the war, as history bore out and as is explained in Chapter 9 of the book, Tjideng Reunion. The Atom bombs without a doubt played a role in cutting short the war and hence our (European) suffering in Asia. The support for this qualified statement is provided by the fact that it took seventeen days after the destruction of Hiroshima for an inkling of this event to be noticed by us in Tjideng and elsewhere on Java. It took a long time for us to become aware that what later has become known in common parlance as a cataclysmic event had taken place on the planet. The Japanese at the time certainly did not see it in that light. The story of mankind is also a story of warfare, and in all wars use has been made of weapons of mass destruction. Over the millennia technical progress combined with the mushroom-like growth of cities has increased both the weapons of destruction as well as the targets. Twentieth century aerial Bombing has replaced starvation by siege of cities. In effect the Atom Bomb was merely a more efficient means of mass killings employing the new tactics pioneered at Guernica, Spain, by Hitler’s Condor legion on 26 April 1937. 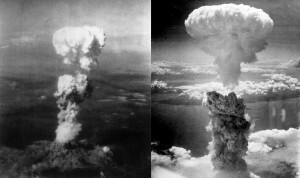 One Response to "Atom Bombs – Hiroshima and Nagasaki"